After primarily being concerned about Model-driven Software Development in general and specifically the concepts openArchitectureWare brings into our daily developer life, I wanted to figure out what Microsoft’s answer is like. The Domain-Specific Language Tools firstly shipped as external package for Visual Studio 2005. For Version 2008 they joined the Visual Studio 2008 SDK. 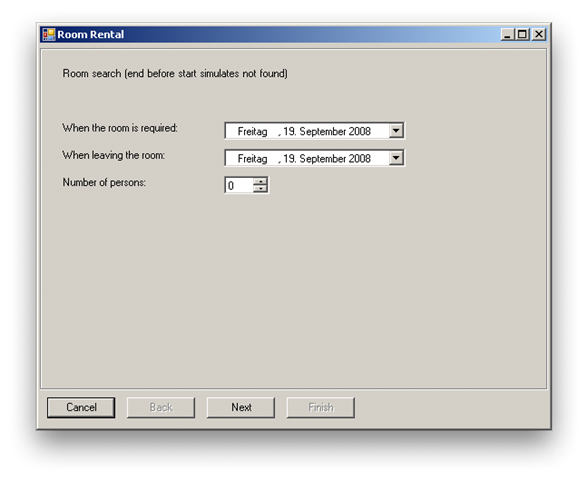 With the DSL Tools Microsoft offers a graphical user interface for creating DSLs. 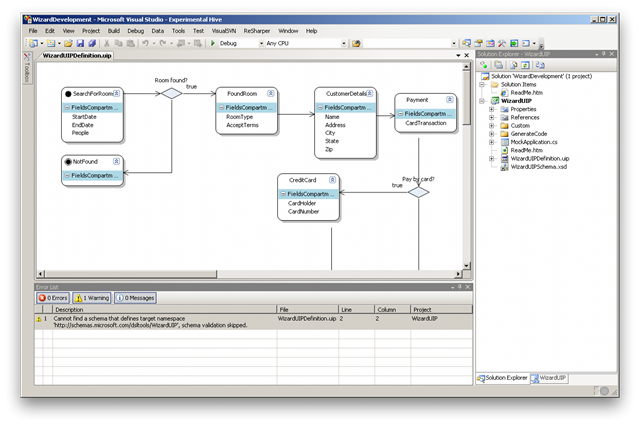 Compared to MDSD terms, the DSL Tools base DSLs on a static meta-metamodel. 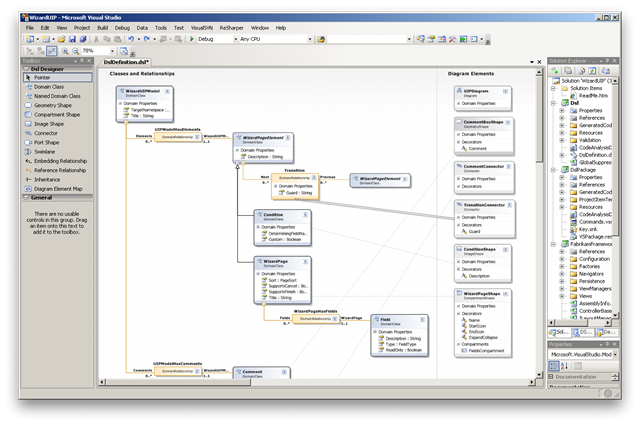 A DSL then consists of Classes and Relationships defining the metamodel on the one hand, and Diagram Elements describing the graphical experience for creating an model on the other hand. Out of this metamodel VS generates a fully typed object-structure as well as designers which can be plugged into Visual Studio or Visual Studio Shell. 3) Another click on “Run” starts the generated wizard program that was defined by the model. For the generation of source code both DSL Tools as well as Software Factories utilize T4, a ASPX-like template language for generating program code, XML or any text files as for example database schemas. A nice thing is that T4 allows you to use your favorite .NET programing language. But it is not even half as powerful as for example XPand template language which is used in openArchitectureWare. It unfortunately lacks support for polymorphism, multi-file generation, protected regions and custom beautifiers. Great presentation on DSL in general as well as the DSL Tools implementation in Visual Studio. It includes some Demos as well. VSX – DSL Tools A lot of how-to videos. These names were just popping up all over. Steve Cook, Book Author, Microsoft, formerly representing IBM on the OMG Team specifying UML2, does now work on DSL Tools + UML. The software factories Microsoft offers are meant to guide through the whole developing lifecycle of an application mostly for one specific horizontal domain. Software Factories are based on GAX and GAT, the Guidance Automation Extensions and the Guidance Automation Toolkit. These are frameworks to create wizards and macros/recipes that guide through the creation of an solution. It would be wrong to say that Software Factories by concept incorporate MDSD principles, but there is still an analogy. I could imagine building a software factory for compositing different models into a very specific ready-to-use-factory that fully considers MDSD principles by using DSLs and Code Generators. Especially these implementations lack at one point: Refactoring! Since code is generated once, instead of generating over and over again, changes on the templates and the model wont affect generated code. The Software Factories are not meant to be used as products! That does’t mean they are not made for productive us, but it means that a isv will have to create own Software Factories build upon GAT/GAX or at they will at least have to highly customize the factories for their end customers use. While DSL-Tools and MDSD often help to get bigger projects done more rapidly, developing a software factories will most likely not return its investments during the first project they are used for. You wont build a car-factory to build one single car either! Dennis Doomen.NET: Software Factories..is it worth it? Audio show with Jack Greenfield and Martin Danner on MDA, UML. Audio talk with Steve Cook about DSLs and Software Factories. Software Factories Gunther Lenz’s Blog on Model Driven Software Development (MDSD) and Software Factories. Note: You need to install the extensions AND the toolkit with two separate installers. 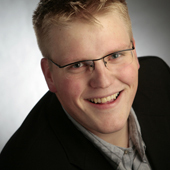 Dennis Doomen – A dutch Speaker and .NET Architect dedicated to the software factory community. Since October 2007, when Microsoft firstly mentioned Codename “Oslo” there has been a lot of rumors on what “Oslo” means. Oslo was never announced as a product, but more likely as a concept and strategy influencing Microsoft’s enterprise and development products line. In fact the Oslo wave grew so big, that the different camps at Microsoft use to describe it differently. A storage repositoryThat is it. That is all Oslo is. Oslo is just the modeling platform. But Microsoft still leaves plenty of room for speculations. As I understand, Oslo is a campaign that affects plenty of products and services. Therefore it’s impossible to say what Oslo exactly is just in a few words. The modeling language/tool to describe schemas for the repository as well as meta models and DSLs? A repository that is able to store and connect tons of data following these models. A process server to host WF, WCF and hopefully own services that brings stability, scalability, hot deployment and all the other services we are used from Java Application Servers. He didn’t say what that will include. The indend, they tell me, is to ship these three chunks of technology in a fairly close succession. As much so as possible. There is nothing left but waiting for the PDC in October. So see you there! Conclusion on what different people say about Oslo. David Chappell on what Oslo is about. ”Oslo” is the code name for Microsoft’s forthcoming modeling platform. Well, everyone who seems to be really important does not say anything about Oslo. But still we got some statements in the past. Douglas Purdy – Product Unit Manager at Microsoft. His vision: “to make everyone a programmer (even if they don’t know it)”.